Late in his life, Shakespeare seemed to get a bit sentimental, writing plays that don’t fit neatly into one of his usual categories. Cymbeline is not exactly a tragedy, although it involves war; it’s not exactly a comedy, although it ends happily, and it’s not exactly a history, although it is about a king. The play is really a modern drama with elements of each and a happy Hollywood ending. Director Anita Rochon makes her Bard on the Beach debut with this small cast of seven who play multiple roles. The setting is ancient Britain where King Cymbeline (Gerry Mackay) is being threatened by the Romans. To Cymbeline’s dismay, his daughter, Imogen (Rachel Cairns), has married Posthumus (Anton Lipovetsky). Cymbeline had ordered her to marry his new wife’s son, Cloten (Lipovetsky), and he banishes Posthumus to Rome. In Rome, Posthumus meets the manipulative Iachimo (Bob Frazer), who makes a bet that he can seduce Imogen. 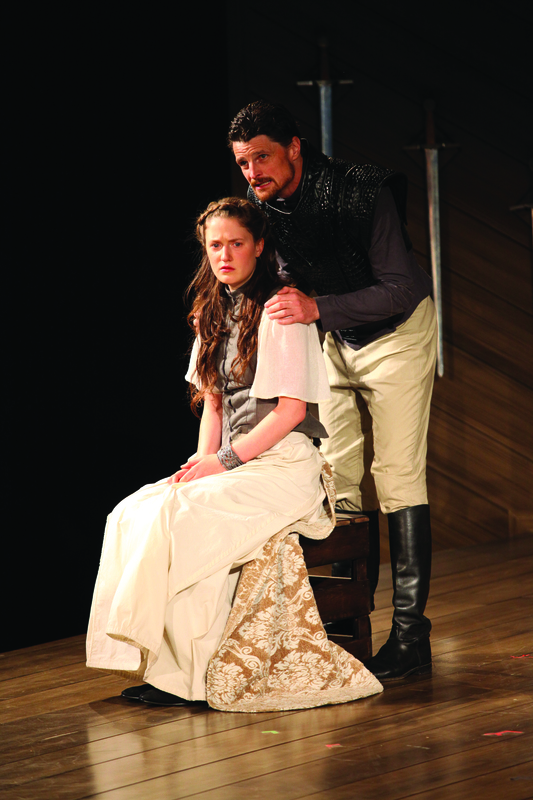 Imogen is one of Shakespeare’s best female leads, and Cairns plays her with subtlety and elegance. Iachimo fails to seduce Imogen with his charms and resorts to hiding in a trunk to gain entry to her bedroom. Bob Frazer was perfectly cunning in this scene as he slinked out of the trunk and around Imogen’s bed. He takes a bracelet from her wrist that serves as evidence of Imogen’s infidelity, and Posthumus orders his servant, Pisanio (Anousha Alamian), to kill her. Pisanio leads Imogen into the mountains, but doesn’t plan to carry out his orders. Instead he tells her to go in search of Posthumus disguised as a boy named Fidele. She meets Belarius, a banished lord who has also disguised himself, and his two sons who are the King’s kidnapped sons. These three cave dwellers provide much of the comedy as they sing and go about their work. Cloten, doting on Imogen and offended by her witty remarks, also provides many laughs. He disguises himself as Posthumus in order to try to win her affections, and seeing that Lipovetsky also played Posthumus, it was quite the feat to keep everything straight and make sure the audience wasn’t confused. Along with Benjamin Elliott, Lipovetsky also played one of the King’s sons, and I lost track of how many times they ran across the stage to quickly throw on a costume piece and instantly assume their other identity. These rapid-fire costume and character changes added another level of humour that Cymbeline wouldn’t normally have. Another added element to this production was the music by Benjamin Elliott. With a few instruments and relatively simple vocal harmonies all performed by the actors, this was the perfect final touch. Dealing with themes of forgiveness, hope, love, and the power to change, Cymbeline is a well-rounded story played by a small, talented cast. Although it is a lesser-known work of Shakespeare’s, I think it is among his best and deserves to be seen more often. Cymbeline runs from July 4 to September 17 at Bard on the Beach in Vanier Park. For more information, visit bardonthebeach.org.